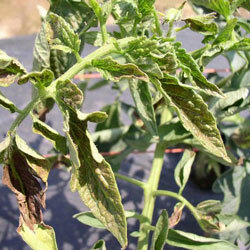 Tomato spotted wilt virus (TSWV) is a major disease that also infects peppers, celery, lettuce, eggplant, peanuts, pineapple, many legumes, many ornamentals, and many weeds. In the U.S. the disease is more common in southern states. 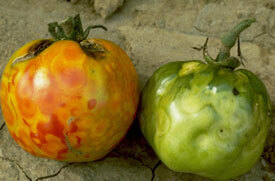 Control of TSWV is difficult because it has a wide range of hosts besides tomatoes which allows it to overwinter. Thrips carry the disease, so control in greenhouses is more effective than in the garden where untreated insects can blow in. Small, dark-brown spots on new leaves causing leaves to turn bronze and die. Dark brown streaks on stems. Plant growth can be one-sided or stunted overall. Die-back of growing tips and dark streaking of the terminal stems is common. Poor quality and reduced yield of fruit. The virus is transmitted by thrips, a tiny 1/16-th inch winged insect. Warm temperatures along with a high population of thrips. Use reflective mulches to discourage insects. Inspect new transplants for TSWV symptoms and thrips infestations. Destroy symptomatic plants as soon as they are detected. There is no cure once infected. Insecticides registered for thrips control have shown good results. Several insecticide applications should be made at 5-day intervals to effectively reduce a thrips infestation.